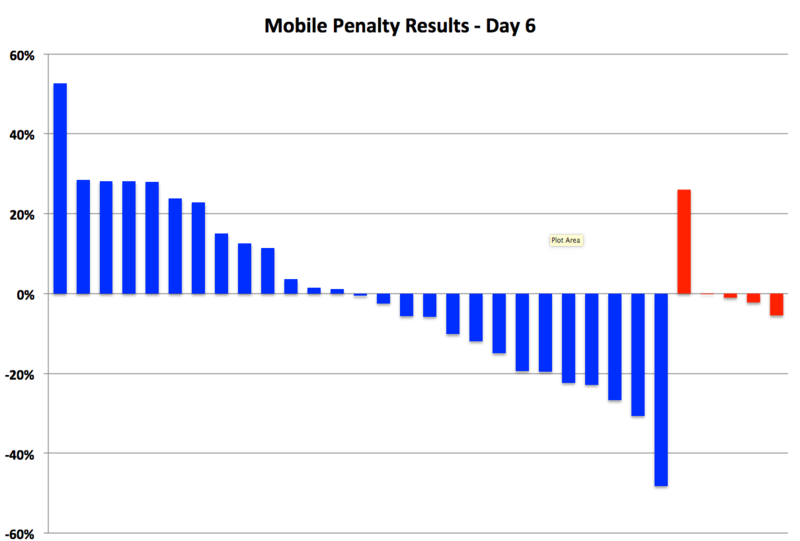 So we’re almost a full week into the hype of the Google Mobile Penalty Roll-Out and…. maybe, just maybe, we are seeing some logical results. Aggregating data across the 59 sites in the study – we’re now seeing natural search traffic from devices for mobile optimized sites up by 5% while non mobile sites are showing an aggregate decline of 3%. Kind of what you’d expect from the algo update, albeit at a much smaller scale. Individual data across the sites in the study remains highly variable with significant swings both up and down. The graph below shows a wide range of performance across the largest of both optimized (blue) and unoptimized (red) sites.